French Roulette is a variation of Roulette that used to be played and invented in France. If you don’t know yet, France is the place where the game of Roulette was invented. 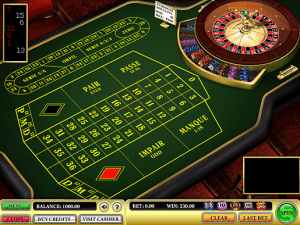 Nowadays French Roulette can be played at the largest Online Casinos. Live, land-based Casinos try to avoid offering it as it features the smallest House Edge from all variations. French variation of this game features a TINY House Edge of only 1.35%. How is this possible as it features the exact same layout and wheel as European Roulette!? Well, the decrease in edge is because of the so called ”La Partage” rule, which allows players to get half of their wagers made on even money bets. When playing French Roulette, you’ll be expected to loose $1.35 for each $100 wagered. A house edge this small is affected by short term variance and will allow you to win a lot of money! You won’t be able to find a better Roulette Type to try out some strategies and Betting Systems at! There’s no variation of this game, where the House Edge would be smaller. While you should always remember that use of any strategy or system won’t increase your mathematical expectation, logically thinking French Roulette is the best place to use these strategies! Try out Paroli and d’Alembert Roulette Strategy or if you have a fancy bankroll, you can always try the most popular of all – Martingale Roulette System. It’s rather hard to find a Roulette Casino that offers French Roulette, as this type makes them way less money than the other variations! However, there still are some that offer it and we’ve listed them below! Again, all Casinos listed on this site are researched and safe to play at!